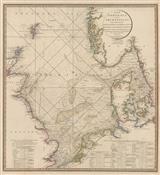 Description: Rare sea chart of the British Isles orietanted east to west and centered on the Isle of Man. Embellished with ships, compass roses, rhumb lines the armorial shields of France, England, Scotland and Ireland. Original hand colour. Description: North Sea. Decorative early Dutch sea chart with original outline hand colour. Description: Rare chart of the Channel referencing surveys made by Edmund Halley during his temporary commission as a Royal Navy Captain in 1701. Description: Small charming chart of the Channel, published during the Seven Years War. This area was about to become a major naval battleground between England and France. Coloured. Description: Thames Estuary. Hand coloured large sea chart of the thames from London and part of the North Sea. Description: Yorkshire, Lincolnshire, Norfolk coasts. Seachart with inset of Burlington Bay. Coloured. Description: Suffolk, Norfolk, Kent Coasts. Two maps on one sheet, The River Thames and a seachart from Suffolk. Coloured. Description: Attractive copper-engraved sea chart of the coastlines of Kent and Suffolk, with inset map of the River Thames from Gravesend to London. Coloured. Description: Grand sea chart along the coastlines of Essex and Suffolk showing Harwich, Handford, Water on Wood, and Bridgehaven. Coloured. Description: Fine chart of the east coast of England from Berwick in Northumberland to Rye in Sussex on an east west orientation. Description: Beautiful Sea Chart of the North Sea between the East coast of Great Britain and the West Coast of the Netherlands. Description: Sea chart of St. George's Channel between Ireland and Wales. Decorative cartouche and dedication to Sir Richard Rooth. Description: Wonderful chart covering the North Sea, the Western Baltic and the Kattegat. Original colour.